America's Classic Movie & TV Authority Since 1987! 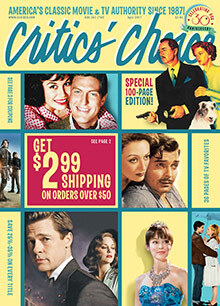 The Critics' Choice Video catalog offers the best bargains on everything from hard-to-find classic movies and TV shows to the latest new releases. It specializes in DVD and Blu-ray comedy, drama, Westerns, film noir, musicals, horror, sci-fi and everything in between. Great Hollywood Classics - Providing hours of great entertainment, they have everyone's favorite old and new flicks from the silver screen. You will find incredible romances, war stories, comedies, westerns, dramas, monster movies and sci-fi adventures starring Barbara Stanwyck, John Wayne, Marilyn Monroe, Jimmy Stewart, Ginger Rogers, Fred Astaire, Audrey Hepburn, Paul Newman, Meryl Streep, Robert De Niro, Jennifer Lawrence and many others. Comedy Best Sellers - How do you like your comedies? Slapstick, screwball or romantic? This is the catalog with the DVD and Blu-ray movies that will have you laughing for days. Here you will find Buster Keaton, The Marx Brothers, Laurel & Hardy, The Three Stooges, Bob Hope, Mickey Rooney, Judd Apatow, Seth Rogan and George Carlin. More than 90 years worth of hilarity are available from studios such as Warner Brothers, Universal, 20th Century Fox, Kino Lorber and many others. Favorite Musicals - Who needs all of that dry, pesky talking when you can sing and dance your way through life?! Critics' Choice video offers thousands of musicals from Busby Berkley to Rodgers & Hammerstein to Gene Kelly to Bob Fosse to DreamGirls, Chicago, Enchanted and many more. Who can get enough of classic musicals such as Oklahoma!, My Fair Lady, Seven Brides for Seven Brothers, Top Hat, Swing Time, Kismet, The Music Man, South Pacific and Gigi? Holiday Classics - It just isn't Christmas without your favorite movies, cartoons and specials on your TV. The whole family will delight in the animated fare from The Grinch to the Peanuts, sing along with Bing Crosby and Danny Kaye in White Christmas or with Bing and Fred Astaire in Holiday Inn, and laugh at Ralphie Parker in A Christmas Story, Chevy Chase in Christmas Vacation, Bill Murray in Scrooged and Arnold Schwarzenegger in Jingle All the Way, or maybe even shed a tear of joy for Jimmy Stewart in It’s a Wonderful Life or at Ebenezer Scrooge's redemption in A Christmas Carol. They have deluxe editions, box sets, and specialty movie packages that make perfect gift giving, too. Since 1987, Critics' Choice Video has been the best source for movies – both new releases and classics – and has become the place to find your favorite shows in any genre.